Researchers from Penn State, Lawrence Berkeley National Laboratory, and the University of Texas at Austin are partnering on a new $2.5-million project to illuminate what happens to carbon dioxide during underground sequestration. The team will use seismic data collected through a novel real-time monitoring system to track the spread of carbon dioxide underground. The four-year project is being funded by the U.S. Department of Energy. The main goal of carbon sequestration is to reduce carbon dioxide emissions into the atmosphere. Sequestration involves injecting carbon dioxide into a contained space for long-term storage. The project is investigating underground sequestration in a reservoir, such as a saltwater aquifer or a mineral deposit. At high pressure, carbon dioxide will fill up pore space in rocks or dissolve into saltwater, but researchers still do not have a clear picture of where the carbon dioxide migrates in a reservoir and whether it has a chance to leak out of the reservoir or injection well. To address this, Tom Daley, staff scientist, Lawrence Berkeley National Laboratory, and project collaborator, developed real-time monitoring equipment in 2007 that is installed during the construction of an injection well. Several times a second the equipment emits an energy pulse that vibrates the material it passes through. By analyzing the vibration that echoes back to the monitoring device, researchers can create a relatively clear picture of the subsurface. However, the presence of carbon dioxide affects how seismic waves travel underground, and nobody had developed a reliable way to use seismic data to track the volume of carbon dioxide until now. Tieyuan Zhu, assistant professor of geophysics, and associate, Institute of Natural Gas Research, Penn State, recently discovered that the amount of seismic-wave energy loss is highly sensitive to the saturation of carbon dioxide. He found that in one sequestration site in Frio, Texas, it was possible to interpret these data to understand the saturation of carbon dioxide in the reservoir. He is combining this knowledge with a state-of-the-art seismic analysis technique, known as full waveform inversion, to develop a tracking algorithm for use with the DOE's real-time monitoring system. "This new technology that we're developing is something we couldn't even imagine five or 10 years ago," said Zhu, principal investigator on the project. 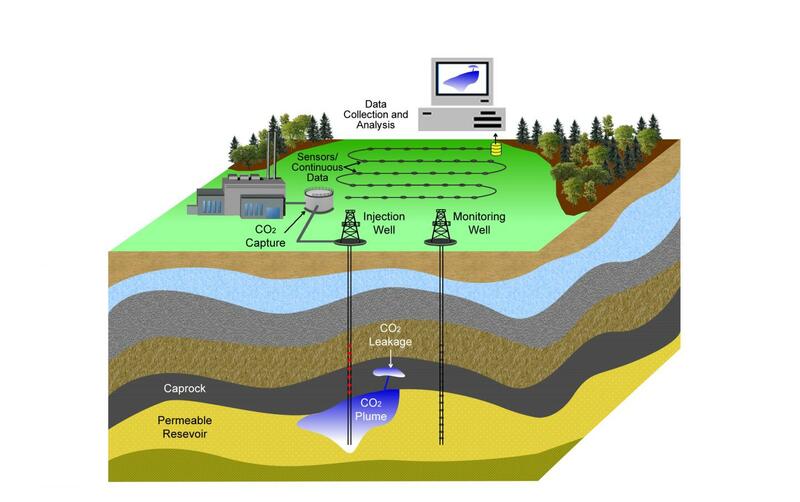 "Our goal is to develop new data-processing tools that will enable the DOE's real-time monitoring system to accurately map the underground carbon dioxide." Tracking the flow and concentration of carbon dioxide underground is a complicated task. The team will start with an initial estimated picture of the subsurface geology, which is the specialty of co-principal investigator Sanjay Srinivasan, professor and head of the John and Willie Leone Family Department of Energy and Mineral Engineering. "When you inject carbon dioxide into the ground, there's the potential for it to leak out or go places you don't want it to go," said co-principal investigator Eugene Morgan, assistant professor of petroleum and natural gas engineering, Penn State. "This project will also help us identify potential leaks while also making sure that we're maximizing storage potential." Using the seismic data collected during injection, the researchers will continually refine the picture of what's happening underground as carbon dioxide first spreads and then increases in concentration in different rock features. They will pair together a variety of computer models implemented in the petroleum and natural gas industry as well as those used to measure earthquakes. Just like in hurricane prediction, the team will use the continual addition of new data to reduce the uncertainty of their picture of underground carbon dioxide storage. Through this work, the team is transforming their initial data into a 3-D picture of the reservoir and carbon dioxide saturation that is updated in near-real-time. The majority of this work will be processed on supercomputers managed by the Penn State Institute for CyberScience. In addition to analyzing data from the new monitoring equipment, the team will conduct a small-scale laboratory experiment to validate their tools at the Lawrence Berkeley National Laboratory. "We are at the cusp of implementing some large-scale carbon-sequestration projects, but what is stopping federal agencies from moving forward is an uncertainty of where the injected carbon dioxide goes," said Srinivasan. "Our project will go a long way toward developing technologies to not only figure out where the carbon dioxide is going but also to identify potential issues that might arise during the process so that they can be mitigated." Jonathan Ajo-Franklin, staff scientist and head of the geophysics department, Lawrence Berkeley National Laboratory, is a co-principal investigator on the project. Alexander Sun, senior research scientist, Bureau of Economic Geology, University of Texas at Austin, is also involved in the project.